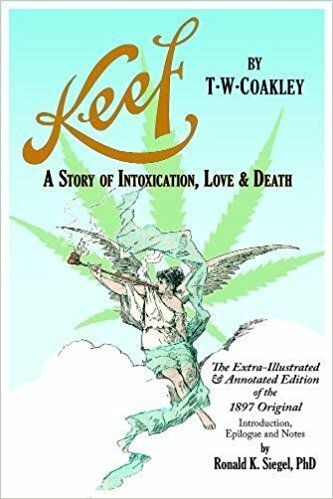 In Timothy Wilfred Coakley’s novel Keef: A Story of Intoxication, Love & Death, written in the witchy style of an Edgar Allan Poe horror story, the narrator, a kif smoker, takes us through his supernatural search for love powered by his “Kif Wisdom” growing from his chronic smoking. At maturity, the wisdom allows him to see that the path to love goes beyond death. Coakley’s novel, in the form of an illustrated memoir, was heralded as one of the most important publishing events of 1897. It made the list with H.G. Wells’s The Invisible Man and Rudyard Kipling’s Captain Courageous. Since average marijuana potency is now approaching kif levels, this book about toxic kif experiences may more applicable to today’s audience than those of 1897. Dr. Ronald K. Siegel is a psychopharmacologist and former research professor at UCLA School of Medicine, author of several books including the acclaimed Intoxication, numerous journal articles based on translations of lost and forgotten works in drug literature, and currently curator of the RKS Library of Drug Literature.